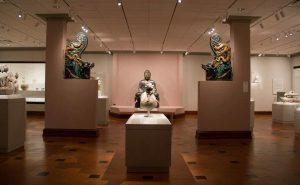 The David Owsley Museum of Art hosts guided meditation almost every Friday. This week’s session is led by Dr. George Wolfe and will explore the topic of meditation as the 4th state of consciousness. All are welcome to attend this free session in the Owsley Asian Art Gallery at DOMA. Dr. George Wolfe is Professor Emeritus at Ball State University where he served as director of the Center for Peace and Conflict Studies. This series is supported by the Ball State Meditation Partnership. *BSU Staff and Faculty: You can receive one point towards the Working Well initiative program for attending the Meditation in the Museum.